Place beverage coolers in places where they won’t disrupt traffic flow.That means avoiding busy spots where customers are already waiting in line for something else. Make restocking easy.Stock your floor with coolers that can be refilled from the back. Stay prepared.Plan to keep backup refrigeration close to upright refrigerated air screen coolers and keep items pre-chilled to make sure food that goes into upright, open air refrigerator models stays fresh, safe and at the right temperature. Grab customers’ appeal with eye-catching design.Try implementing shaped or curved merchandising units to mix up classic C-store design. Replace the energy guzzlers.Implement rifled copper tubing into refrigerator equipment and replace electric pans with hot gas condensate pans to lower energy consumption. Make decisions based on the unit’s overall life cost.Look beyond an equipment’s initial purchase price to consider the long-term returns an energy-efficient unit would mean for your bottom line in terms of energy saved in annual operating costs. Keep it clean.Grab-and-go display models are the most energy efficient when operators execute proper clearance around the unit; that means allowing for breathing room to prevent the condenser from overworking itself in tight spaces. 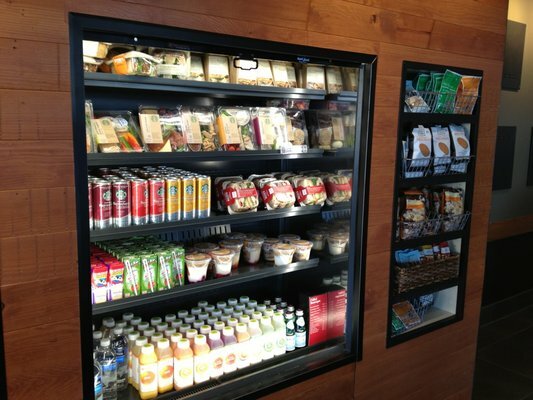 Size matters.Grab-and-go display units maintain higher levels of energy efficiency when the model has the proper ventilation space, including being surrounded by cool air. Invest in a night cover.Keep cold air inside and reduce overall energy loss by covering the grab-and-go unit with a night cover. “Greater consumer awareness of health and wellness.”Let consumers know what products are produced sustainably in order to impact your bottom line. “Stronger influence of recycling and environmental issues.”The study names a package’s “recyclability and reusability of packaging” as a major consumer purchasing power. Look for ways to include PET and glass bottles for beverages and find ways to implement conservation tactics into packaging. “Increasing disposable income and purchasing power.”The study points to eye-catching, non-traditional packaging types as a way to attract consumers.